20 weeks till Gay Games 9 track and field competition opens in Akron, and the team members are slowly changing gears at the Sunday practice. As we start to focus on event specific practice, we are diverting from a single training program to multiple programs. 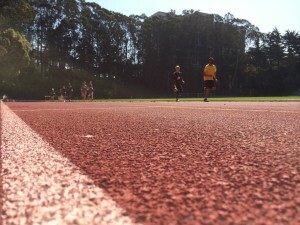 Today, after the warm-up drills, one group did 2 x 500m, 2 x 200m and 4 x 40m, while another did 4 x 400m, 2 x 200m and 5 x 100m. Some of our members are also competing at Bay Area Senior Games on May 10. This is a qualifying event for next year’s National Senior Games, so they are working hard toward their goals. For the rest of us, USATF Pacific Association’s championships on June 1 (Open) and June 14 (Masters) are coming up. 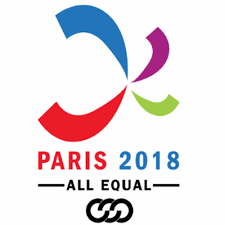 They are usually big meets we train for, but since this is a Gay Games year, many of us are not conditioning for these meets. Some of us may still compete to check our progress, though. Go team STF&FC! The hunt for the new coach is coming to an end with Mark Jellison verbally agreeing to be our coach. Contract is being drawn as we speak. As soon as we agree on basic terms, we should be good to go. We are very excited about this new development and will let you all know when this is finalized. We are looking for volunteers who can help us at San Francisco Rock ‘n’ Roll Half Marathon Beer Garden on Sunday, April 6. Available shifts are 6:30 am – 8:30, 8:30 – 10:30, 10:30 – 12:30 pm. Volunteering for multiple shifts is always welcome. Please let Koji Kawano know if you can help the team by volunteering. We are still accepting orders for the team red polo shirt. We will be wearing this team polo shirt at the Gay Games opening ceremony. Please check in with Marcus Valera if you want to place an order or want to try it on.